Stuffed Mushrooms - Vegans Eat What? Vegans Eat What? 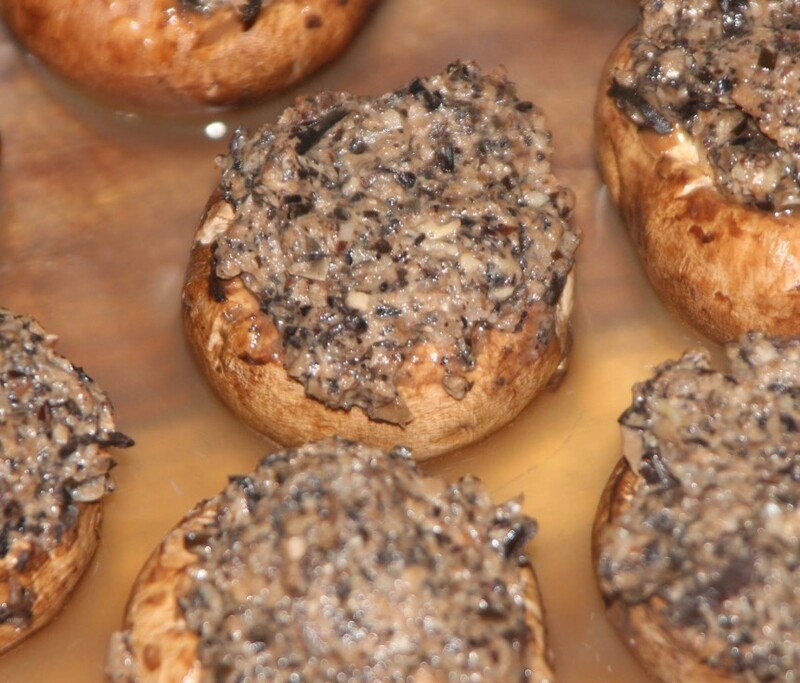 These marvelous mushrooms are stuffed with a mixture of walnuts and arame. If you haven't cooked with sea vegetables before, these mushrooms are a great way to start. Rinse the arame and place it in a medium bowl. Add enough water to cover and let it soak for 10 minutes, or until reconstituted. Drain the arame and discard the water. Place the arame in a medium saucepan with the water, sake (if using), and shoyu. In a small skillet, heat sesame oil over medium-low heat, then add the onions. Sauté for 5 minutes or until the onions are translucent. Fill each mushroom cap with the arame mixture, packing firmly and mounding it until all the mixture is used. Arrange caps in an oiled baking dish and cover lightly with aluminum foil. Bake at 350 F for 20 minutes, or until the mushrooms are cooked. Arame is a sea vegetable that has a very mild flavor. Ginger juice is available in small bottles generally near the spice section. However, you can also grate ginger, put the pieces in cheesecloth, and squeeze out the juice. You can chop and add the stems back into the mixture, but the taste will be more subdued. Throw them in a pot with a stew instead. I use cremini mushrooms rather than button for a richer flavor. -Decrease nuts to ½ cup and add ½ cup pitted black olives. -Instead of button mushrooms, stuff 3 or 4 portobello mushrooms. -To serve, cut into wedges with a sharp knife. The recipe is adapted from from "A Life in Balance" by Meg Wolfe.